If you asked me what were the week’s big media stories I’d name three: Clinton Cash and its coverage, the Bruce Jenner interview, and some ways back, in third place, new questions about some anecdotes (unclear how many, or what they all are) told by Brian Williams. Reliable Sources apparently did not concur with my judgment. After a few clips from the Correspondents’ Dinner, Brian Stelter led off with a full segment on the travails of Brian Williams. More would follow later in a second full segment featuring Dan Rather, the reliable source who pioneered the use of “fake but accurate” forged documents. Sandwiched in between was a celebration of the Bruce Jenner tell-all interview; the two LGBT activists seemed to focus more on their shared goals than on media issues. Mr Stelter suggested that people who didn’t want to watch the interview may be guilty of “intolerance,” which if true would pretty much indict the majority of Americans. 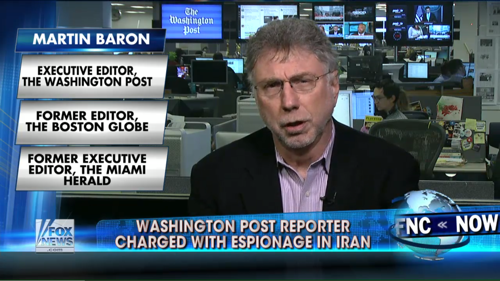 Next was a segment on the Washington Post journalist held in Iran: an important topic but not exactly time-sensitive given that he’s been in that jail for the better part of a year. Stelter gave the segment a little faux urgency by trumpeting his “exclusive interview” with the Post‘s Martin Baron. It may well have been “exclusive” in the sense that nobody else was talking to him at 11:44 ET this morning, but it would be silly to claim he hasn’t been talking to anyone else about this issue. In fact he was on Fox News discussing it just a few days ago. Throw in a full segment dedicated to the Comcast merger that isn’t happening and that’s a wrap for today’s Reliable Sources. Notice something missing? Nothing whatsoever about Hillary Clinton, Clinton Cash, or the unusual similitude between the New York Times, the Washington Post, and Fox News, all of whom are pursuing the story. Unless I missed it, her name was never even mentioned on the show. A Google search of cnn.com and money.cnn.com turned up no Brian Stelter articles or videos about the controversy or its coverage over the past week. If you like, you can check out how much attention Mr. Stelter gave the subject on twitter. The Cable Game is played at the very highest levels at CNN. Things happen (or don’t happen) for a reason, and there are few if any coincidences. If Brian Stelter is bending over backwards to diminish the Hillary Clinton cash story with benign neglect, he’s not going rogue. PS: Meanwhile, want to see a media conflict of interest that is overdue for attention?